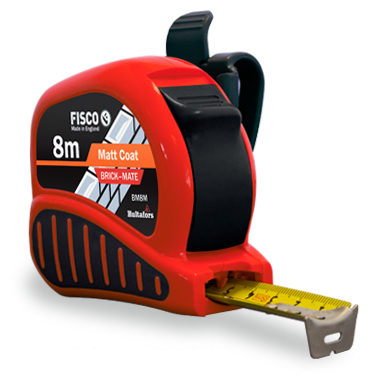 A specialist tape measure designed to aid professional bricklayers in their work. The unique blade design accurately calculates brick and block quantities and course heights, plus there is a conventional metric scale, which is accurate to EC Class I, for general measuring. Use the Brick-Mate for any bricklaying job - big or small - it will save time, effort and money. Unique blade design* with three scales to calculate brick & block quantities and course heights, along with a conventional metric scale accurate to EC Class I. Bright, ergonomic ABS case with non-slip rubber grip pad. Easy-to-operate positive action lock, minimising blade slip. Bump stop for added blade and end-hook protection. Unique snap-in quick-release belt clip holster. * The unique Brick Mate blade scale is designed for UK standard brick (215mm wide x 65mm high) and block (440mm wide) sizes.